Panther’s Run Golf Course, located just up the road from Myrtle Beach in Ocean Ridge Plantation in Sunset Beach, NC is just one of four premier golf courses in this complex. The big cats family of golf courses consists of Panther’s Run, Leopards Chase, Tiger’s Eye, Lion’s Paw – with Panther’s Run perhaps the easiest of the four. The brain child of course designer Tim Cate, Panther’s Run opened in 1995 and features a seamless blending of design and nature to create a stunning natural setting in a golf course that will test your skill in a fun and challenging 18 holes. Prior to designing Panther’s Run, Tim Cate worked on Lion’s Paw with Willard Byrd so he got to know the area well before creating Panther’s Run. This allowed him to work with the natural landscape and very little dirt had to be moved to create this spectacular layout. In 2010, the greens at Panther’s Run were changed to MiniVerde to ensure a smooth and true roll of the golf ball. Expect the greens to be in excellent condition when you add Panther’s Run to your Myrtle Beach golf package. The maintenance crew works hard on this golf course to maintain a great playing experience for all golfers. One thing that you will notice that is different on this Myrtle Beach golf course is the two sets of tees for ladies – that is in addition to the regular sets of tees to ensure fair play for all ages and skill levels. From the back tees, Panther’s Run comes in at just under 7100 yards, a great length for those long hitters to be able to pull the driver out of the bag. 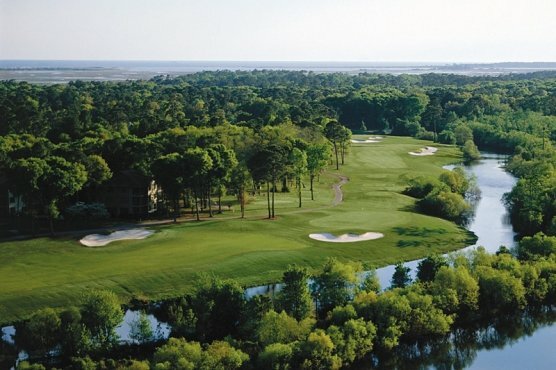 Named as one of the Top 50 Golf Courses in Myrtle Beach and given 3 ½ stars by Golf Digest, Panther’s Run has become a favorite for locals and visitors alike. Show up for some practice prior to your tee time and take advantage of the long and short game bunkers, two putting greens and of course a nice driving range. There are also two big and classy clubhouses that you can use when you add Panther’s Run to your Myrtle Beach golf package. Overall the course is forgiving and the finishing hole is the most scenic on the course. Panther’s Run will make for a memorable round of golf for players of all levels.